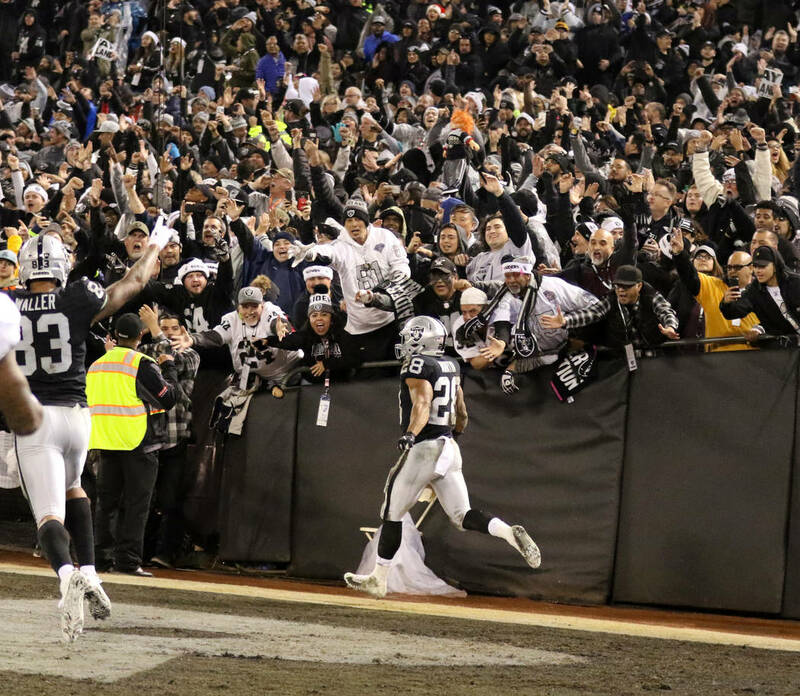 The Raiders have chosen a cast-a-wide-net approach when characterizing their search for a stadium at which to play their home games in 2019, a public position that has produced a couple of consequences. OAKLAND, Calif. — The Raiders have chosen a cast-a-wide-net approach when characterizing their search for a stadium at which to play their home games in 2019, a public position that has produced a couple of consequences. The first is speculation. Could it be this region? Or that one? Or how about this one? Options of varied plausibility are left on the discourse table. The other, naturally, is hope. Ali Farhang, a lawyer based in Tucson, Arizona, embodied both when building a case for his town. In early January, this led to an unlikely phone call from team president Marc Badain. 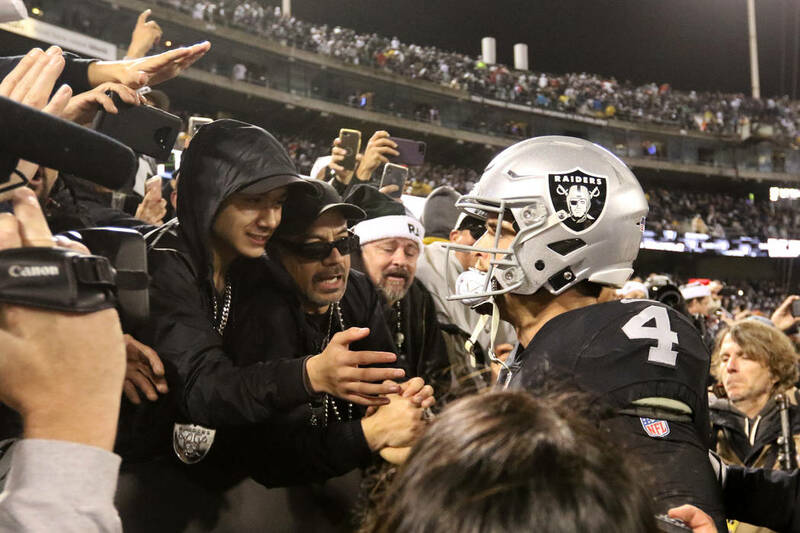 Several questions followed the Raiders into this new year, none more pressing than “where?” An answer on their 2019 home venue is expected within the next few weeks. In the interim, speculation and hope are rampant, rumored options spanning from the West Coast to London. On Dec. 24, the team played the final game under its lease at the Oakland-Alameda County Coliseum. Although the club has not publicly ruled out a 2019 return, that outcome became less attractive to owner Mark Davis after the city of Oakland’s Dec. 11 filing of a federal antitrust lawsuit against the NFL and all 32 clubs. 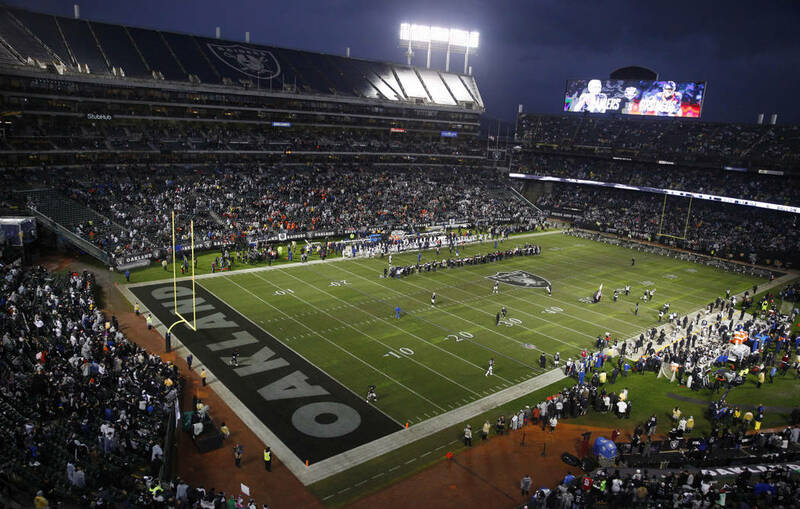 The Raiders are ensured to play one of their eight home games next season abroad, be it Mexico City or London. That game’s location could be known before the team finalizes its other seven games. Last season, the London slate was announced Jan. 11, 2018. As for these seven, it has been the team’s preference to remain near its headquarters in Alameda, California. The facility neighbors Oakland International Airport. The club would rather avoid accessing that airport 20 times in a five-month span between the preseason and regular season. There also is the attraction of the region’s fan base whose support has been felt despite the franchise’s 2020 relocation to Las Vegas. Internally, Oracle Park (formerly AT&T Park) in San Francisco and Levi’s Stadium in Santa Clara have been the subject of conversations in recent months, as the Raiders reviewed the feasibility of those and other local options. The San Francisco Giants, who play at Oracle Park, confirmed in December that early discussions between the sides had begun. Predictably, the notion promptly turned political. Multiple San Francisco elected officials disparaged the possibility, conveying in multiple reports that such an arrangement would be considered a betrayal to Oakland. Politics innately would accompany any Bay Area extension. 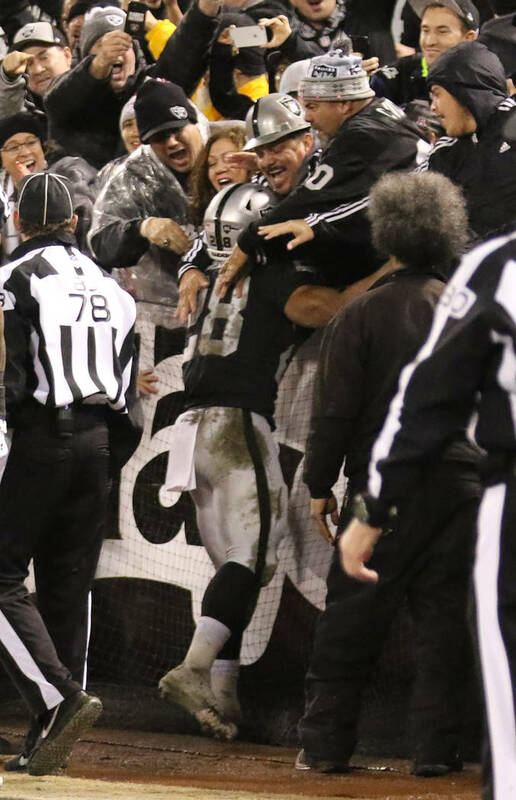 Until the Raiders do so formally, a return to Oakland in 2019 cannot be ruled out. 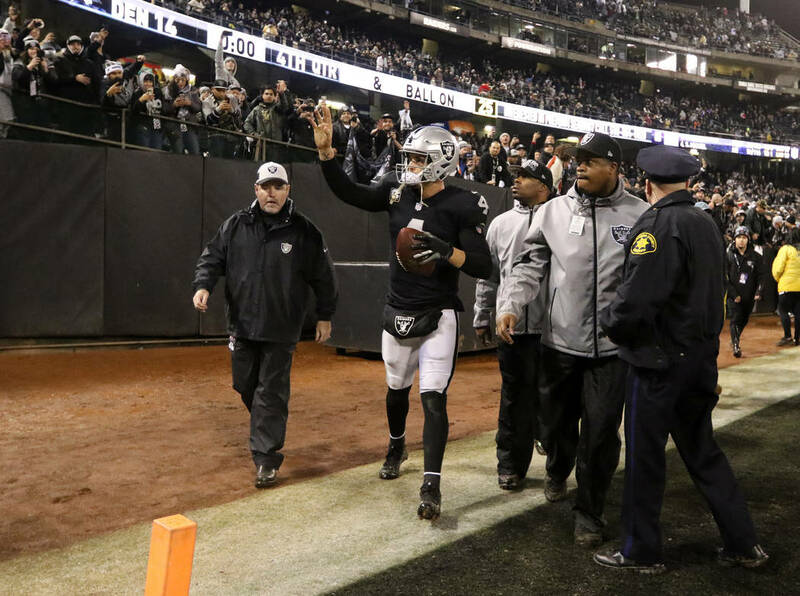 The team and its fans approached a Christmas Eve win there over the Denver Broncos as if it was the franchise’s final game in Oakland. 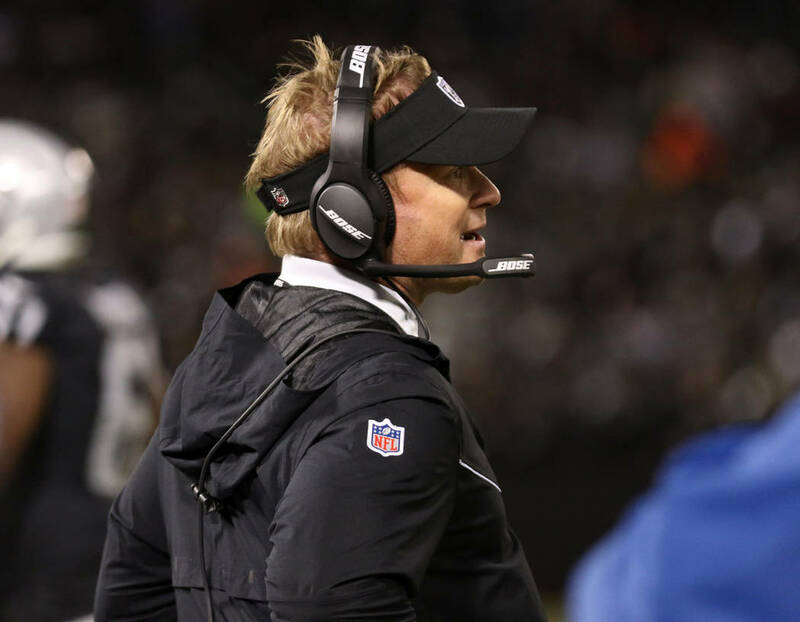 On the night before, coach Jon Gruden showed players a video during a team meeting to reflect on the history at the Coliseum. After the game, fans danced on dugouts. Some rushed the field. 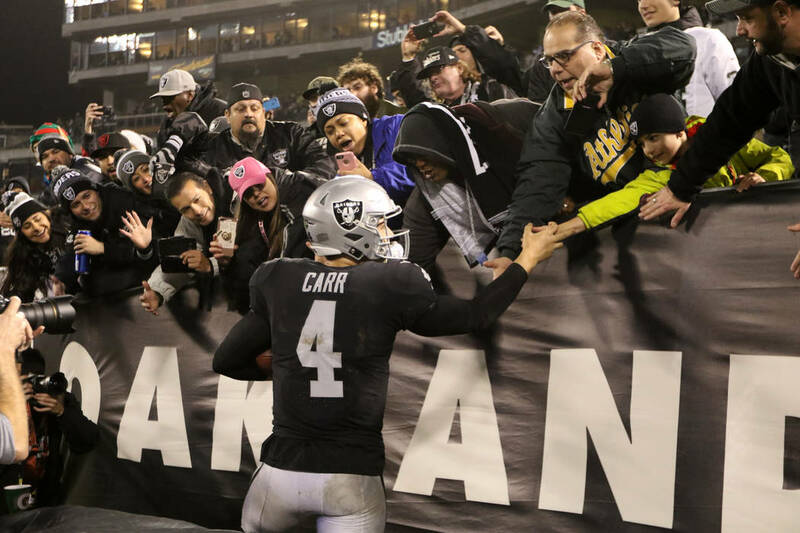 Quarterback Derek Carr jogged the field’s perimeter, high-fiving and thanking fans. It felt like the end. So, too, did it in San Diego when the Chargers played their final home game of the 2015 season. They returned to the city the next year before moving to Los Angeles in 2017. 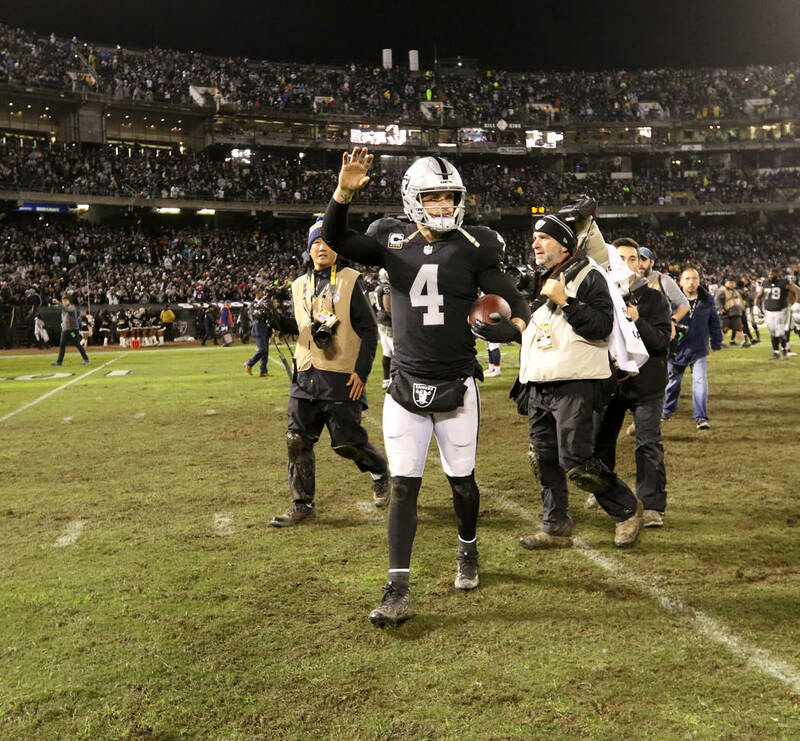 A number of factors can be cited as to why San Diego makes a highly unlikely, if not a nonstarter, option for the Raiders in 2019. Chief among them is that moving a third team into Southern California, even for a year, would undercut the fan following that the Rams and especially Chargers are working to cultivate in Los Angeles. The Chargers are engaged in what could be a decadeslong process to build an acceptable fan base. Another franchise moving into their former home of 56 years wouldn’t stand to facilitate that. There also is the apparent lack of communication between the club and San Diego, which a city official indicated in an email Tuesday. “Our office has not been in communication with the Raiders,” said Craig Gustafson, senior director of communications for Mayor Kevin Faulconer. Intrigue exists for many in San Diego that the NFL theoretically could return there this year. Such a return, however, is dubious for however long the Chargers are based in Los Angeles. Coach Jon Gruden was less than giddy last year about traveling to London for an Oct. 14 game against the Seattle Seahawks, describing himself as “concerned” about the 11-hour flight that involves an eight-hour time difference. So this wouldn’t go over well. 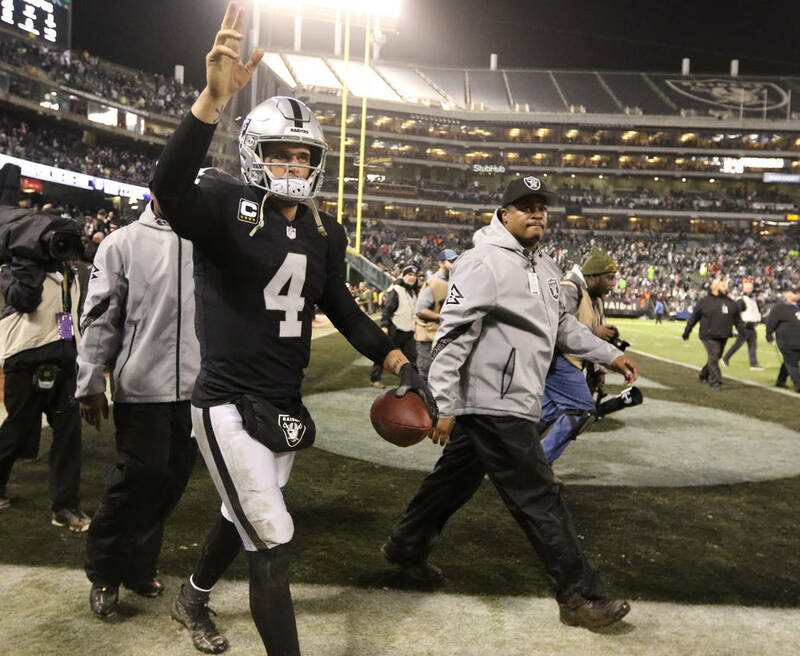 Speculation that the Raiders could become the NFL’s trial balloon for a team in London arose from a December report via Fox Sports analyst Jay Glazer. He mentioned the option as something other league owners mentioned to the Raiders, who discussed it. Beyond that, there isn’t much here. Significant work and investment would be required for the Raiders to call London a temporary home. Of the cities often floated, none would be more disruptive to their organization than this. Day-to-day operations would be complicated, such as visits or workouts for free agents. The list of drawbacks goes on. On Jan. 5, a spokesman at the Tottenham Hotspur Football Club said in an email it’s the club’s policy not to “comment on speculation.” David Tossell, head of public affairs for NFL Europe, offered a similar response. Months ago, Sam Boyd Stadium was ruled out as an acceptable 2019 venue. 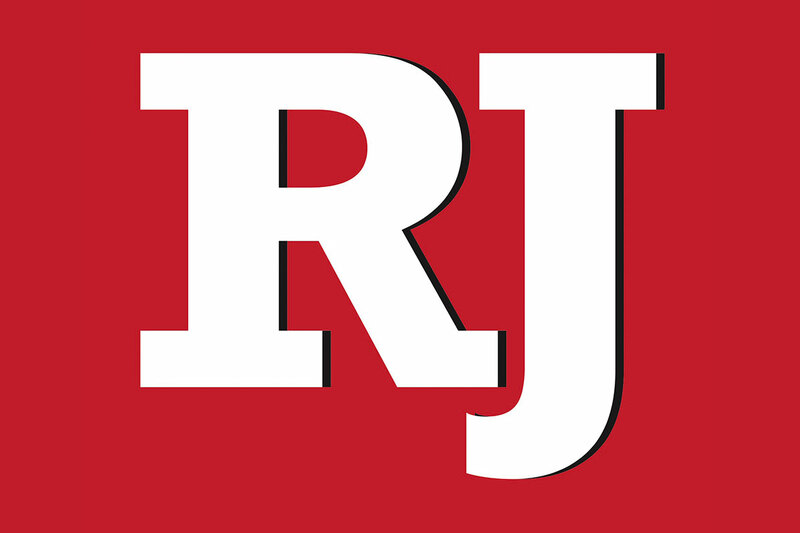 Early this month, a spokesman from the UNR athletic department said that no contact existed between the department and the Raiders as of late check, which was shortly before Christmas. The spokesman added that he would call back if, upon checking with the appropriate people, that changed. So, it seems, Nevada won’t factor into this equation as a wild card. Perhaps another, less discussed region might. To partake in the required guessing game here would be a futile activity, given the multitude of options. Sandra Bullock in “Bird Box” would serve as much use as guide. A Raiders official did not respond to a request for comment, as the organization understandably keeps a close quarters when navigating this process. The club is weighing all options. Because of Farhang, that includes Tucson. Farhang recently pitched to Badain the concept of Arizona Stadium, located on the University of Arizona campus. This conversation occurred after the idea was approved by high-ranking school officials and the Arizona Cardinals’ ownership, Farhang said. A meeting has been requested with the Raiders.